white-throated needletail : The Two-Way When a white-throated needletail was spotted off the northwest coast of Scotland, dozens of enthusiasts rushed to the area. "Twitchers" is British slang for those who have a passion for spotting hard-to-find birds. But their joy turned to grief when the little bird from Asia hit a wind turbine. 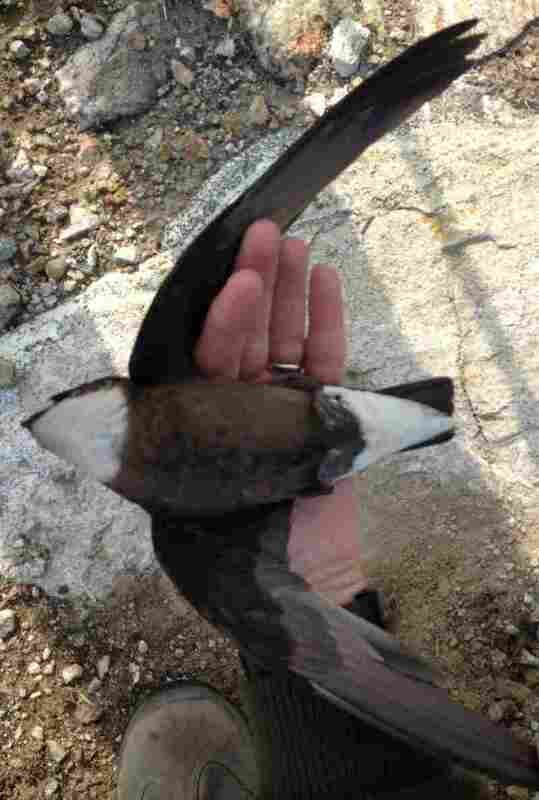 The white-throated needletail, after it was found below the wind turbine it hit on an island off the northwest coast of Scotland. One of only a handful of a type of small bird from Asia to have been spotted in the U.K. in the past two centuries was thrilling twitchers off the northwest coast of Scotland earlier this week. Then, tragedy struck. It flew into the blade of a wind turbine and was killed. Needless to say, watching the little white-throated needletail fall to its death dismayed those who went to the Outer Hebrides to see it. Dozens of twitchers ("British slang for a person who will travel long distances to spot as many hard-to-find birds as possible") had rushed to the area Wednesday after hearing from Rare Bird Alert U.K. and other spotters that the needletail was there. "It was really beautiful when it was flying around, graceful and with such speed," John Marchant of the British Trust for Ornithology tells The Scottish Sun. "To suddenly see it fly into a turbine and fall out the sky was terrible." "One minute it was flying in spectacular fashion," adds James Hanlon, a twitcher, in a story posted by the International Business Times. "I followed it and then watched as it flew into one of the blades of the wind turbine and vanished. My heart jumped into my mouth. We dashed over to see if it had been killed and sadly found its body on the ground. It was heartbreaking." There were, writes enthusiast David Campbell on his Devil Birder blog, "cries of sorrow and anger from the assembled birders" when they found the bird "lying beneath the machine ... stone dead." He's posted a short video of the twitchers gathering around the bird. According to The Scotsman, the white-throated needletail is thought to be the "world's fastest flying bird" — capable of hitting 105 mph. One hadn't been seen in the U.K. since 1991, the newspaper adds, and "a spokesman for Bird Guides said it was only the ninth recording in the U.K. since 1846." The Australian government says the needletails breed "in Asia, from central and south-eastern Siberia and Mongolia, east to the Maritime Territories of Russia, Sakhalin and the Kuril Islands and south to northern Japan and north-eastern China." They spend their non-breeding seasons "in Australasia, mainly in Australia, and occasionally in New Guinea and New Zealand, though it has been suggested that some may overwinter in parts of South-East Asia." The government adds that "there is no published estimate of the world population of the white-throated needletail; it is not considered globally threatened." How the bird that was killed this week got lost and ended up over Scotland isn't known, though several experts are quoted in reports as suggesting that it may have been blown there by bad weather. "The death of any bird is tragic, but when it comes to climate change we are talking about extinctions, here in the UK and globally. One synthesis study in the journal Nature estimates that 15-37 per cent of species would be 'committed to extinction' by 2050 under a mid-range global warming scenario. "So, if you're mourning for the needletail that died this week, don't blindly lash out at wind power. Do something about it. Insulate your home, install some solar panels, drive less, buy wildlife-friendly food — because every single act we take to reduce our footprints will save lives."